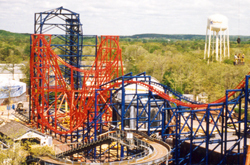 Six Flags Great Adventure's skyline was changed in 1997 with the addition of the new Batman and Robin The Chiller coaster. Extending above the treetops to a height of 200 feet, the dead-end tracks of the dual racing linear induction powered shuttle loop roller coaster could be seen from around the park. The ride based on Warner Bros. Batman and Robin movie would wrap up construction in late spring and only open for a few days before closing for adjustments and tuning. Days turned into weeks, weeks into months, and before the end of the summer season it was announced that Batman and Robin The Chiller would not reopen until the following season. Great Adventure's new signature attraction would have to wait until 1998. 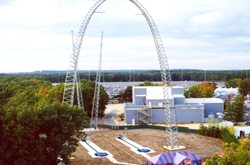 Other ride related changes for 1997 included the addition of the park's largest upcharge attraction called Dare Devil Dive. The skycoaster ride dominated the area next to the Carousel where guests could see up close rider's screaming faces as they swooped down to Earth from its 153 foot perch. Two rides were relocated because of the installation of The Chiller. 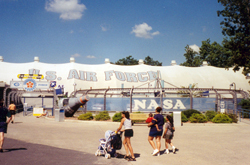 Both the Space Shuttle and Centrifuge G-Force ride were added to the top section of the Boardwalk not far from the Right Stuff Mach 1 Adventure. 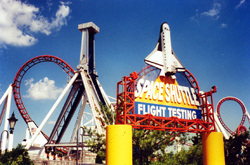 The two rides were loosely themed to the Right Stuff movie while in Movie Town, so there addition next to the simulator made sense. 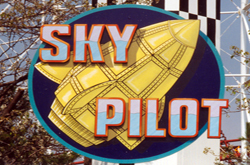 To extend the theme, Joust-A-Bout was renamed Sky Pilot. 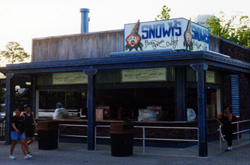 Changes to facilities at the park included the addition of Snowy's snack stand and the Iceworks gift shop near the new The Chiller ride. A new show venue was also added to the area in front of the Viper roller coaster. 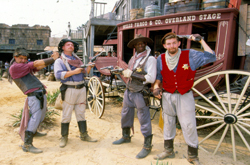 Venom Gulch featured western gunslingers in a comedic performance set in the dust blown desert lands between Viper's queue and the walkways next to the western bridge. Meanwhile, over at the Showcase Theatre guests enjoyed the Music of Warner Bros. which paid tribute to all the great movie soundtracks and televisions shows through the years. Lastly, just down the road from Six Flags Great Adventure a new shopping complex opened which was branded with the Six Flags name - the Six Flags Factory Outlets. 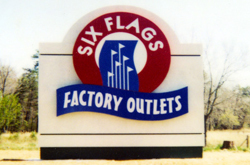 Although not owned by the park or its parent company, the shopping outlet complex made use of he Six Flags name for easy association of where the stores were located. Cross advertising between the park and the outlets was promoted and shuttle service from Six Flags Great Adventure's main entrance was available.